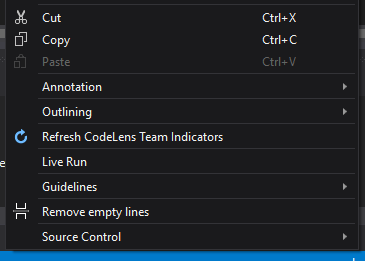 Once the extension is installed, a "Remove empty lines" option is available when right clicking in a file. If there is some selected text, the selection will be the only part of the document that will be processed. With the version 1.1.0, you can edit the number of allowed lines, for that go on "Tools => Options => EmptyLine Extension", and edit the option "Allowed lines", by default there is no values, in this case, 1 line is kept, if you didn't want any line, then set value to 0. All numbers are allowed for this option. The extension is only available Visual Studio 2017.